The United States of America (also called the United States, the U.S., the USA, America, and the States) is a federal constitutional republic comprising fifty states and a federal district. The country is situated mostly in central North America, where its forty-eight contiguous states and Washington, D.C., the capital district, lie between the Pacific and Atlantic Oceans, bordered by Canada to the north and Mexico to the south. The state of Alaska is in the northwest of the continent, with Canada to the east and Russia to the west, across the Bering Strait. The state of Hawaii is an archipelago in the mid-Pacific. The country also possesses several territories in the Pacific and Caribbean. At 3.79 million square miles (9.83 million km2) and with over 312 million people, the United States is the third or fourth largest country by total area, and the third largest by both land area and population. It is one of the world's most ethnically diverse and multicultural nations, the product of large-scale immigration from many countries. The U.S. economy is the world's largest national economy, with an estimated 2011 GDP of $15.1 trillion (22% of nominal global GDP and over 19% of global GDP at purchasing-power parity). Per capita income is the world's seventh-highest. Indigenous peoples descended from forebears who migrated from Asia have inhabited what is now the mainland United States for many thousands of years. This Native American population was greatly reduced by disease and warfare after European contact. The United States was founded by thirteen British colonies located along the Atlantic seaboard. On July 4, 1776, they issued the Declaration of Independence, which proclaimed their right to self-determination and their establishment of a cooperative union. The rebellious states defeated the British Empire in the American Revolution, the first successful colonial war of independence. The current United States Constitution was adopted on September 17, 1787; its ratification the following year made the states part of a single republic with a strong central government. The Bill of Rights, comprising ten constitutional amendments guaranteeing many fundamental civil rights and freedoms, was ratified in 1791. 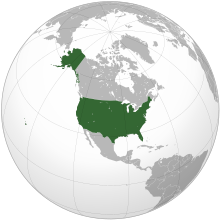 Through the 19th century, the United States displaced native tribes, acquired the Louisiana territory from France, Florida from Spain, part of the Oregon Country from the United Kingdom, Alta California and New Mexico from Mexico, and Alaska from Russia, and annexed the Republic of Texas and the Republic of Hawaii. Disputes between the agrarian South and industrial North over the expansion of the institution of slavery and states' rights provoked the Civil War of the 1860s. The North's victory prevented a permanent split of the country and led to the end of legal slavery in the United States. By the 1870s, its national economy was the world's largest. The Spanish–American War and World War I confirmed the country's status as a military power. It emerged from World War II as the first country with nuclear weapons and a permanent member of the United Nations Security Council. The end of the Cold War and the dissolution of the Soviet Union left the United States as the sole superpower. The country accounts for 41% of global military spending, and is a leading economic, political, and cultural force in the world.